Do you believe in ruling the galaxy through fear of force like the great Grand Moff Tarkin? Are you incensed by the millions of good Imperial men and women killed by a backwater teenager in a spaceship using some old superstitions? Do you believe the Empire should stand strong? 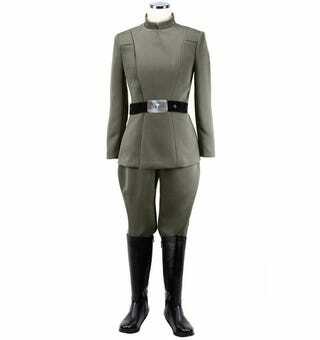 Then this Imperial Officer uniform may be right for you! Created by Anovos, this uniform is their first product for women in their Star Wars line. According to the site, accuracy was important to it's design. No expense was spared in our research and development of this Imperial Officer Uniform. We used reference from various patterns and screen-used uniforms from not only Lucasfilm Archives but also private collections, modifying them from the original patterns to create a women's version. Further, we also replicated the precise color and texture in a synthetic fabric that gives you premium quality without the high cost of cavalry wool. Unfortunately the boots are not included but you do get the hat! They do also have a men's version as well. You may want to subjugate and exploit a few alien planets first as the outfit is a bit pricey at $500. No word yet on how to earn marks of rank.